Ideas, Designs, Knitwear Design, and Photography © Irene & Mr.Sheep Co. unless stated otherwise. Designer: Irena Velichko. Please do not use the visual content without our prior permission. Handbag by INZI High Fashion, Fashion Jewellery © Christina C Accessories. Knitwear Boutique » IRENE & MR. SHEEP® Co. specializes in Organic and Natural Yarns and Wellness Products. We sell Premium and Deluxe quality Natural, Organic and Handspun Yarns, Gemstone Gifts, Organic and Natural Beauty products, Premium Quality Whole Leaf Teas, Deluxe Coffee, and other items. Most of the yarns we sell are spun from precious woolens such as angora, cashmere, baby camelhair, mink fiber, yak wool, alpaca, llama and Merino wool. We ship within 24 hours. 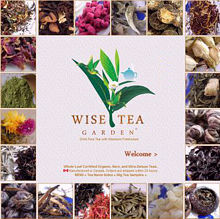 Our subsidiary Tea House WISE TEA GARDEN® specializes in premium quality Whole Leaf Teas, deluxe Ashanti® coffee, organic and heirloom non-GMO foods. We inventory more than 150 varieties of teas and tea spices sourced all over the world. All our teas are lab-tested in Canada. Please visit us for purchases on a tax-exempt website ». Our store is located in Toronto, Canada. We ship worldwide. Orders are dispatched within 24 hours and mailed within North America and to United Kingdom, France, Italy, Switzerland, Spain, Denmark, The Netherlands, Germany, Austria, Spain, Portugal, Cyprus, Australia, New Zealand, Sweden, Norway, Finland, Hong Kong, China, Malaysia, Israel, Russia, Poland, Japan, South Korea, Romania, UAE, Turkey, India, Peru, Brazil, Mexico City, and other countries, territories, and capitals. Shipments are released every day except weekends. Express items are shipped 24-7. Note: We don't ship to military bases. Packaging materials we use are 100% recyclable. About ». Prices on yarn in our shop are ranged from $7.00 to $99.98 per 50 gr. To save on purchases at our store, please apply for a volume discount program, or choose free items from our List of Giveaways.